Pensando Sobre…Vitamin D Deficiencies, Discipline Deficiencies, And A Few Weeks In “A Cidade Maravilhosa”! | Georgia Teachers Speak Out! ← Standardized Cheating Scandals In Atlanta And Dougherty School Systems; New Evaluations; Re-districing In Atlanta; Gangsta School Systems; Training For Cobb County’s Rambunctious School Board; Treating Motivational Breakdowns As If They Were Technical Breakdowns; Educational Sluts & Pimps; And Other Holiday Potpourri! Pensando Sobre…Vitamin D Deficiencies, Discipline Deficiencies, And A Few Weeks In “A Cidade Maravilhosa”! 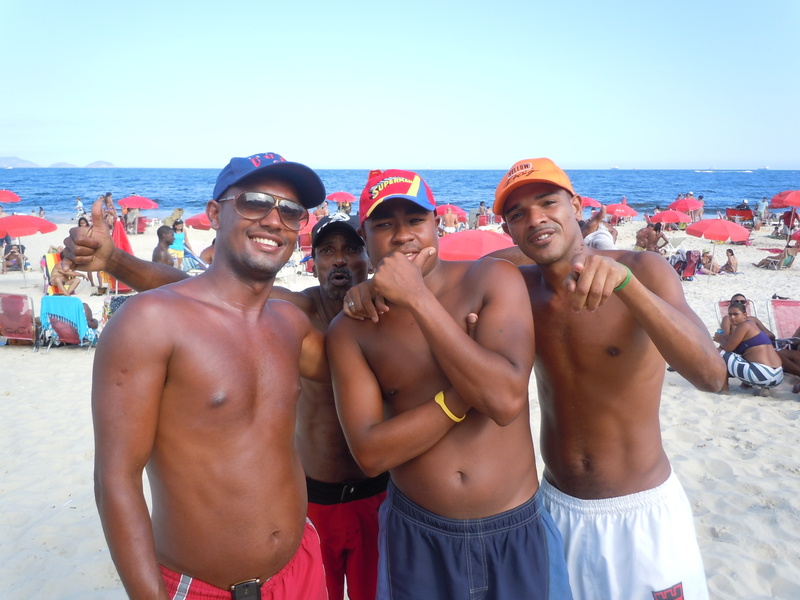 Jefferson (L) and his co-workers and my friends on the Copacabana Beach (Dougie Fresh in the middle; Leo on the right; and Mikie in the background). Jefferson speaks flawless English (the King’s English). I asked him last year where he learned his English, and he replied, “On the sand.” Haven’t I always asserted that the motivation to learn is a social process? He told me today that he can make more money by being able to speak English. He also told me that he travels by bus two hours each way to get to the beach to make money. These guys are really garcons (pronounced with a soft “c” sound) of the beach. A garcon is a waiter, and they wait on you hand and fist. Whateve you need, they get it (chairs, large umbrellas, tables, drinks, food, etc.) for you. They make their money on tips. Dougie Fresh also speaks great English and Leo and Mikie speak functional English. The key to learning a language or math or science or whatever is motivation, but our educrats totally ignore this and treat non-learning like it is a technical breakdown rather than a motivational breakdown. Assim Eu falo portugues mais ou menos, mas Eu me viro. Translation: Even I speak Portuguese more or less, but I get by. I am enjoying the Vitamin D down here in Rio de Janeiro. (I like to come down here to escape a few weeks of the Georgia winter.) I actually bought a new John Grisham book (at least new to me) this evening, The Confession, and a book by Michael F. Holidk, Ph. D., M. D., and Mary Jenkins, The UV Advantage, in Shopping do Sul (beautiful mall) this evening. Dr. Holick is the most renowned scholar on Vitamin D and says that a significant chunk of our population is Vitamin D deficient which leads to many, many chronic diseases, including cancer and heart disease. He has published hundreds of articles in “referee” journals (meaning research articles judged by peers before accepted by journals). We have swung from one extreme to the other, trying to avoid all sun. The sun helps heal our bodies! There’s no better source of Vitamin D than the sun. Nothing else compares – certainly not Vitamin D-fortified milk. This rather irrational avoidance of the sun reminds me of schools trying to improve performance without the students being exposed to Discipline. We have a Vitamin D deficiency in our culture and a Discipline deficiency in our schools! By the way, those folk (like my children and not like their father, a light skin cracka!) who have a significant amount of melanin in their skin and who live outside the Tropics should get even get more sun exposure because the melanin blocks so much of the sun’s rays. Vitamin D, baby, Vitamin D! Can I write off this trip as a Vitamin D Vacation or just a little Heliotherapy? Brazilians claim that God is Brazilian! (I certainly think that God has a great sense of humor!) They say that God created everything in five days, and on the sixth day, He created Rio de Janeiro. He then sat back and was satisfied and rested on the seventh day. The city is just that beautiful. They call it, “A Cidade Maravilhosa” [Ah See-dah-jee Mada-vil-yosa]! The Marvelous City! The Christ Statue, Cristo Redentor [Cree-stew Hey-den-to], is the eighth wonder of the world (and is worth the trip all by itself!). It was erected in the early1930s and towers over this beautiful city like our Statue of Liberty towers over the New York Harbor. The Vitamin D that our schools need is Discipline. Without Discipline, all kinds of chronic situations break out in our schools. This irrational avoidance on the part of educational policy-makers and educrats to even discuss Discipline is irrational and only contributes to the constant illness of our public schools. 2 Responses to Pensando Sobre…Vitamin D Deficiencies, Discipline Deficiencies, And A Few Weeks In “A Cidade Maravilhosa”! Where I teach in DeKalb County, our kids need sun, as well. Very few schools actually have a recess period where teachers take kids out to play. I think discipline would be improved if recess were consciously built back into the day. This is the case in many Atlanta area schools. Kim, you are absolutely right. Taking away recess is ludicrous! When I was in elementary school, we had it twice a day. Recess was done away with because the almighty concern over the dumbass standardized test scores! We have allowed numbskull educrats and policy-makers to cheat our children.